Now, I know that I focus mainly (and mostly) on (and about) chocolate but occasionally I divert (I’m thinking the cheesecake lollipops are only partially related to chocolate) and in this case, I diverted with Black Rose Love fudge and rock. The design is the first thing you notice. 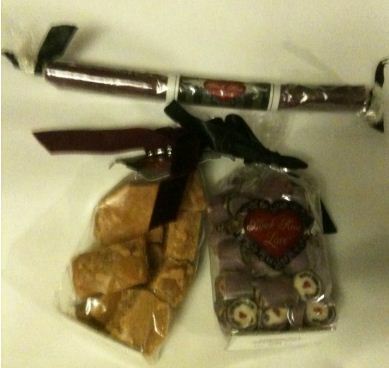 Everything follows a theme and the bags of delicious looking sweets are carefully created. This is more than just a pick and mix – this is a nicely crafted sweet with attention paid to the packaging. I tried the fudge first. 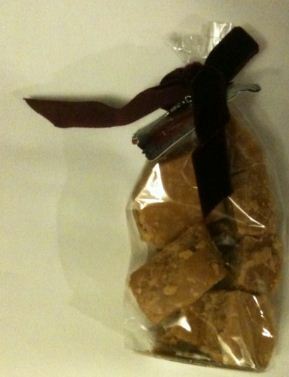 This is a GENEROUS bag of fudge so you are definitely getting what you paid for with enough for yourself and to share. I had this earlier in the day and I think it is like a fudge a lot of people will love. I’m a huge fan of creamy fudge so it didn’t quite do it for me but I’m Canadian so I’m weird 🙂 It didn’t have a flavour that stood out so will appeal to a large number of people so perfect for a party or as a gift. Each page comes with a Tibetan charm and mine was a butterfly. The perfect addition to make this a gift along with the red velvet ribbon and cute tag. 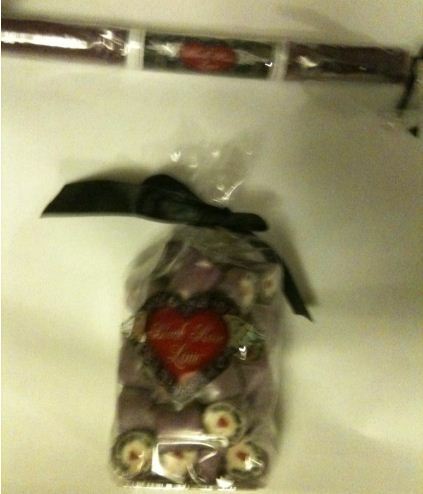 The black rose love blackcurrant rock was different. I swear it tasted slightly of peppermint but mainly of blackcurrant. This isn’t the kind of overwhelming blackcurrant flavour of a cough sweet or a can of Vimto – this is more subtle and as such a very pleasant candy. It is really rather cool that it has the brand name running through it and makes it a lot more special than most rock. All in all a nice old fashioned sweet selection with the added bonus of a different flavour of rock than usual. Would make the perfect gift!